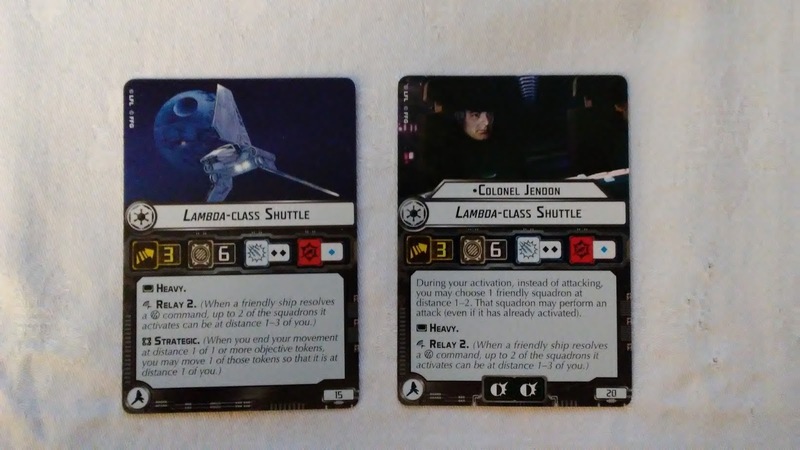 Here we have two of the more interesting new mechanics of the new Wave 5 squadrons. 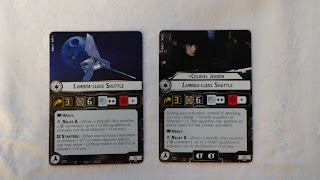 The Lambda-Class Shuttle shows off the new Relay keyword as well as the Strategic keyword. Let's take a look at the shuttle, and what those new keywords can mean for your overall squadron strategy. All things considered, it is not a good stat line for a squadron. 3 speed, 6 hull, 2 Black anti-squadron and 1 Blue anti-ship (without Bomber). Heavy. Where the Lambda-Class Shuttle becomes reasonable are its other keywords, which act in support of the rest of your fleet. Relay 2 lets you activate squadrons from effectively anywhere - good if you have a carrier or flotilla that has otherwise left the fight. Note that the Lambda-Class can Relay itself, as it is within Range 1 of itself. No need for Boosted Comms with one of these guys hanging around your squadrons. The other big benefit is the Strategic keyword, allowing you to end your movement at distance 1 of an objective token, and move it so that it is at distance 1 of you. That is a fairly substantial movement ability, perfect for things like Salvage Run, Intel Sweep, Fire Lanes, or other objective token based objectives. Same statline, so not particularly amazing. Keeps Relay 2 and Heavy, but loses Strategic. Gains 2 Brace tokens, which can help keep his 6 hull intact. The big win for Col. Jendon though is his special ability: "During your activation, instead of attacking, you may choose 1 friendly squadron at distance 1-2. That squadron may perform an attack (even if it has already activated)." Who is the best squadron to use this with? Darth Vader comes to mind, hitting like a sack of bricks. Bossk also hits hard, as does Maarek Steele. Heck, any Interceptor with Howlrunner will hit hard too, or get another attack in with a Firespray. Ran one of these guys as first player in a Sensor Net game the other day. Strategic only fired once but pulling one token away from the second player is a huge point swing in that mission. And relay helped out a bit late game when things got spread out. 15 squadron points is a big ask for situational abilities, but it's hard for me not to want one of these guys in every list now. I would argue that tokens on obstacles and tokens on ships cannot be moved. Relay is one of the game changing mechanics of wave 5. They negate the need to fly your Gozantis into the main fight, increasing survivability. And don't require boosted comms. Because their stat line isn't great, the opponent often focuses on killing the squadrons which can actually shoot back - so the poor stat line is not all bad! I would like to think people have learned that Intel squadrons need to die first. I think they will quickly learn the same about Relay squadrons.